Chen Kaige, self-trained as a filmmaker, was the director for this award winning 1993 film. Prior to “Farewell, My Concubine“, Chen received modest acclaim for the “Yellow Earth” and “The Big Parade”. With “Farewell, My Concubine,” he won the Palme d-or in Cannes. Although the film is in Mandarin with English subtitles, the story captured me from the beginning. If you are interested in Chinese history, this film spans several decades beginning near the end of the Qing Dynasty. On the surface, it is just a story of two boys who happen to become famous, but have their difficulties like most of us lesser mortals do. However, the setting shows the transformation of a nation from the Qing Dynasty to a warlord dominated republic, the Japanese invasion of World War II and then Mao’s Cultural Revolution. I saw this movie a decade ago and I remember this powerful, dramatic story of one man’s life from the day his mother took a knife and chopped off an extra finger on each hand so he would have five instead of the six he was born with. The main character is apparently modeled after an actual person—Peking Opera superstar Mei Lanfang—some may imagine that Lanfang was ‘gay’. However, he only specialized in male roles. He was married at least three times and had children. The Last Empress of China ruled the Qing Dynasty as a coregent after her husband, the Xianfeng Emperor died in 1861, and her son, The Tongzhi Emperor (1856 – 1875), was too young to rule China. Technically, The Empress Dowanger Tzu Hsi (Cixi) wasn’t the last empress. However, she was the last empress to rule China as a regent for her son, and then her nephew after her son died at age 19. Many current history texts have slandered the Dowager Empress Tzu Hsi (1835 – 1908) without much evidence as one of history’s most monstrous women—a ruthless Manchu concubine who seduced and murdered her way to the throne in 1861 to rule China through prevision, corruption and intrigue. This is how many still think of Tzu Hsi. In addition, she has been accused of murdering her son, and then years later her nephew, who died the day before she did. Instead, her son may have died of syphilis because it was rumored he preferred prostitutes to the hundreds of virgin concubines that belonged to him. Some rumors claim that Tzu Hsi had her nephew poisoned, but Yuan Shikai may also have poisoned him. There is no evidence to support either theory. How did the Tzu Hsi earn such a bad reputation? It seems that she earned this reputation similar to how today’s China has been smeared in much of the Western media. To understand how this came about, I will make a comparison to Jayson Blair, a young reporter for the New York Times who wrote more than 600 articles for the newspaper. During his short career with the New York Times, Blair committed repeated “acts of journalistic fraud”, including stealing material from other papers and inventing quotes. However, Jayson Blair was not the first reporter to commit “acts of journalistic fraud”. Edmund Backhouse did the same thing writing about Empress Dowager Tzu Hsi at the beginning of the 20th century, and his lies and deceit wouldn’t be discovered until Sterling Seagrave was researching for his book Dragon Lady decades later. And Backhouse’s journalistic fraud served as the foundation for most history texts still used today that continue to slander Tzu Hsi. To learn who the real woman was we may want to consider what Robert Hart had to say about Hzu Hsi in his letters and journals. Robert Hart arrived in China from Ireland in 1854 to learn the language and work as an interpreter for the British consulate in Ningpo. In 1859, almost five years later, Hart quit his job with the British and went to work for the Emperor of China as an employee. He returned to England in 1908. For most of his stay in China after 1859, Hart was Inspector General of Chinese Maritime Customs and worked closely with the Imperial ministers and Manchu princes. Before returning to England, Hart met with the Dowager Empress in a private audience. Tzu Hsi died in 1908 a few weeks after Robert Hart left China. The Qing Dynasty collapsed in 1911. Peking Opera is a combination of several styles of Chinese opera. The metamorphosis started during the Qing Dynasty (1644-1911), about two hundred years ago. Peking Opera focuses on historical events, legends about emperors, ministers, generals, geniuses and great beauties. Performances are a combination of singing, dialogue, pantomime and acrobatic fighting and dancing. Today, Peking Opera is considered the highest expression of Chinese culture. The origins of Peking Opera did not begin in Peking (Beijing). The opera had its start in the Chinese provinces of Anhui and Hubei. Experts say the opera was born in 1790 and was originally staged for the royal family and then the public. There are thousands of these operas that cover the history and literature of China. Peking operas can be divided into two categories. “Civil” operas focus on singing while “Martial” operas feature acrobatics and stunts. Some are a combination of both. We arrived early when the parking lot and the streets were about empty. That’s the best time to get there. 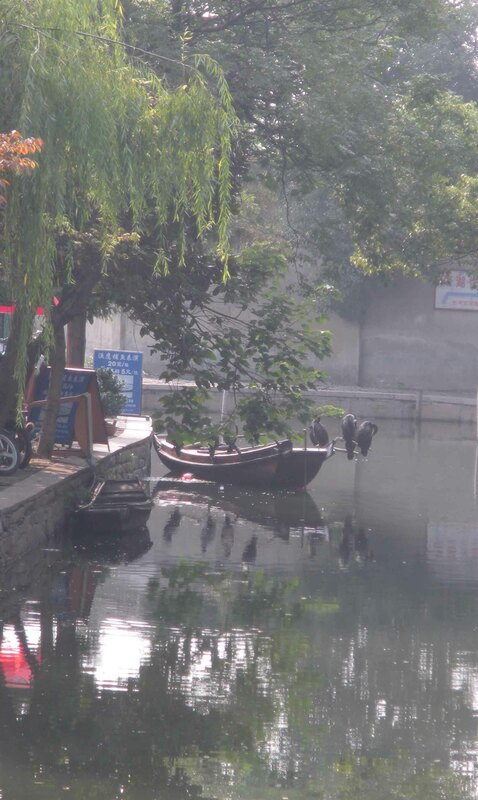 Zhouzhuang is surrounded by water, and boats are needed for most short trips. Zhouzhuang history is rooted in China’s Spring and Autumn Period (770 BC – 476 BC) more than a thousand years before Venice was established. 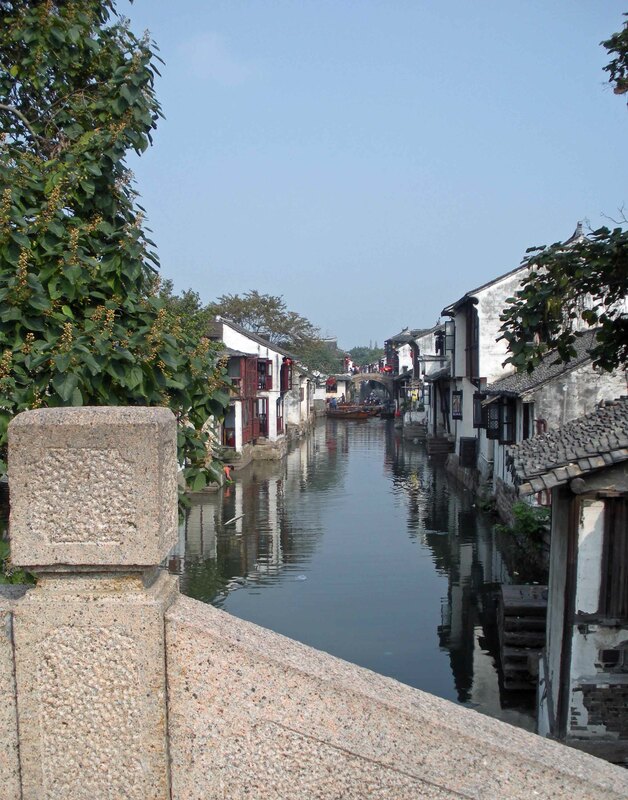 However, it would not be called Zhouzhuang until 1086 AD . 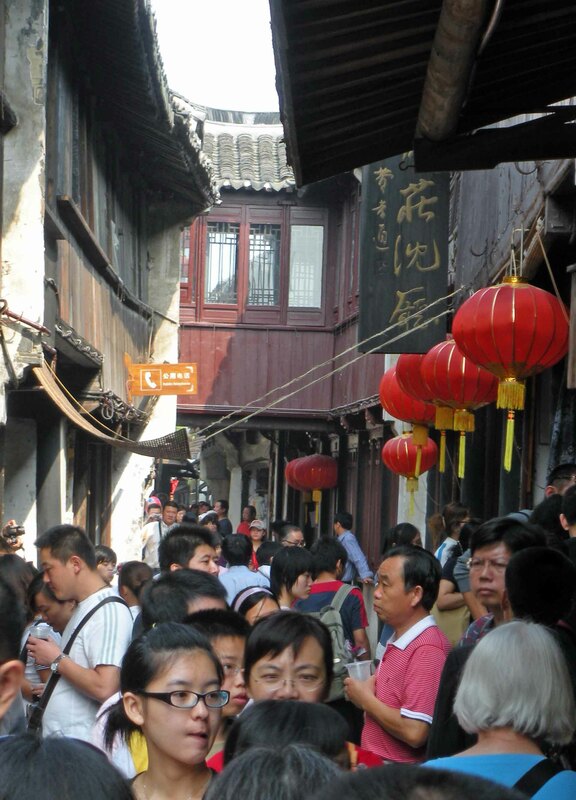 The town is well known for its preservation of numerous buildings from the Ming and Qing Dynasties. 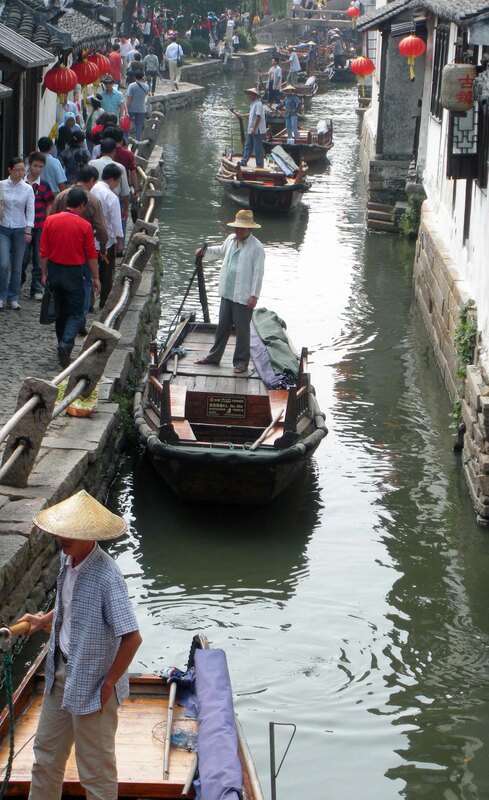 Zhouzhuang, the Venice of Asia, is on the United Nations Reserve List for the World Cultural Heritage and the Dubai International Best Practice to Improve the Living Environment. As you can see, it gets crowded. 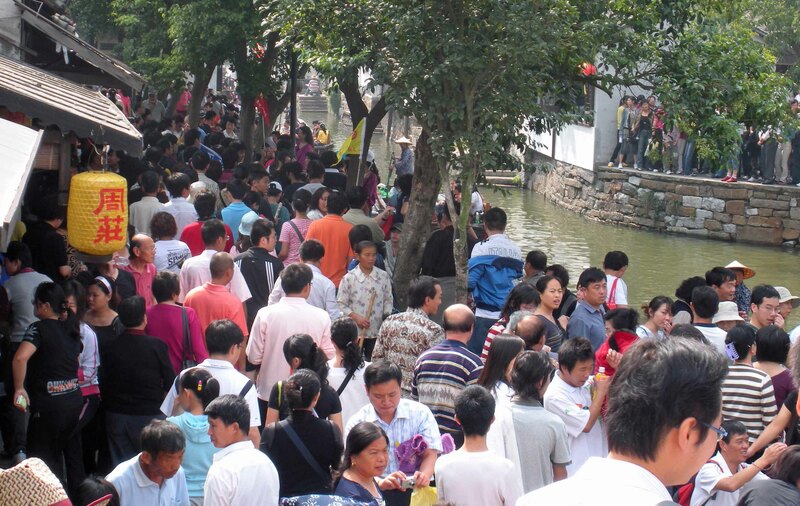 Most of these tourists were Chinese citizens from the growing middle class. This is where I was a photo thief. I wanted to take a picture of these captured birds but the owners wouldn’t let me. He pointed at a sign that said I’d have to pay. I walked a distance and used my meager telephoto lens to take this shot of the birds tied to the owner’s boat. For a comparison with Venice in Europe, while there are no historifcal records that deal directly with the founding of Venice, available evidence has led some historians to agree that the original population of Venice were refugees from Roman cities near Venice (420 – 568 AD). From the ninth to the twelfth centuries Venice became a city state. Change taking place in China is not happening as fast as many Western critics want it to. To these critics, China should flip the feudal switch to democracy and the light should come on without effort. However, in spite of Western pressure to speed things up, changes are taking place as planned by China’s government—one step at a time. For example, foot binding was around centuries when the Qing Dynasty (1644 to 1911) first attempted to end the practice that would continue until 1949. In 1976 when Mao died, twenty percent of the population was literate. Today more than 90% can read with a goal to reach 99%. In 1985, school reform was implemented making nine years of education mandatory for all children. Academic achievement became the new priority over the political consciousness of the Mao era. An example of how China’s education policies have brought about change may be seen among the “Granite Women”, who live near the coast in southeast China. For centuries, these women carried blocks of granite from the quarries where their husbands, brothers and fathers worked cutting the stone. However, today, China’s economic reforms along with education are changing the old ways. Younger women, who have now had an education, know what they don’t want to do with their lives. For centuries, others such the Qing Dynasty and the Nationalists failed to improve the quality of life in China for women. Where these others failed, the CCP appears to be succeeding.